Beautiful Waterfront Craftsman-Style Cottage, just minutes from Seven Springs and Hidden Valley Resorts. Private setting among native laurel and hemlocks, just a few feet away from Trout Stream, with creekside patio and firepit, bridges, and hiking trails. Carefully restored cottage circa 1927 is filled with charm, as well as latest conveniences including high speed WiFi Internet and SmartTV with Netflix and Amazon. Great room with 17 windows overlooks stream below; Sounds of waterfalls are heard throughout! Full kitchen with all new stainless steel appliances and modern front load laundry. Hardwood dining set with extended seating for 6. Stone fireplace, and Gas Stove. 2 bedrooms with sleeping for 5, with 2 additional sofabeds, and sofa. My day job is an enginner for a major IT company, while my hobby is historic home renovation. I am married and we live in the Washington DC area with our 2 children. I grew up in Pennsylvania, and I love the Laurel Highlands. The atmosphere and setting of this property is breathtaking. It is very close to the resorts and other attractions in the Laurel Highlands, but is an attraction onto itself. -Beautiful setting among the stream and woodlands. - Trail leads directly into state park; makes for great hike or morning jog - 1 mile/5 min to ski resort. Easy for skiers and nonskiers -Walk to resturaunt with good food and great prices - The atomsphere at sunset during the summer on the stone patio and firepit with a nice glass of wine with friends is priceless. Large bath with 2 sinks recently renovated. Modern Tankless Hot Water heater provides unlimited hot water even for large groups. Cast Iron Gas Stove similar to woodstove with glass on 3 sides; remote temp control. Living Room with Stone Fireplace. Large comfortable Craftsman Sofa and Lounge Chair. Desk with office chair. Mr Coffee Ground Drip Coffee Maker. Coffee Provided! My friends and I had a wonderful time at the cabin - the great room is perfect for card games and hanging out. The back yard is laid out very well for relaxing/lounging, and the volleyball/badminton area was a perfect area for a few games of corn hole. All in all, a really neat, old craftsman style cabin, with a really unique setting. The place was very nice! Just a couple things that I wish would have been a little different. The fireplace in the back room was not working so that room was very cold. Since it was so cold back there, even with the heater on we chose not to hang out in there, so we did not get to enjoy the view while hanging out playing cards. The House was very close to the street. We did know this going there from the reviews but it was to close for us. When relaxing out back to a fire, we did hear the large trucks flying by. We did think that there was a wood burning fireplace. I may have misread that but either way, that was a bummer. That is one of our favorite things. Other than that, this is perfect for the winter months if spending time at the slopes. Super convient to everything. We still enjoyed ourselves very much! Thanks much for your review! Yes so sorry we had a temporary issue with the remote control for the one fireplace in the back room while you were there and it was a rather cold that weekend. (There are 2 fireplaces, and the other fireplace in the living room had been working). We also provide firewood for the outdoor firepit. It is a convenient location, and in the winter having good road access can be a blessing. Glad to hear you enjoyed your time there! David's bungalow was perfect for our brief getaway. We were looking for a nice quiet spot relatively central to hiking trails and Fallingwater. This spot hits the nail on the head. With easy access to many local restaurants (Out of the Fire, Silver Horse Coffee, and the Wine Bar on Main Street) as well as hiking and other attractions (Fallingwater, Cucumber Falls is a must see, as well as hiking in Ohiopyle and the surrounding parks) - who could want more? We were lucky enough to get a dusting of snow overnight which made for a nice surprise and great ambience. 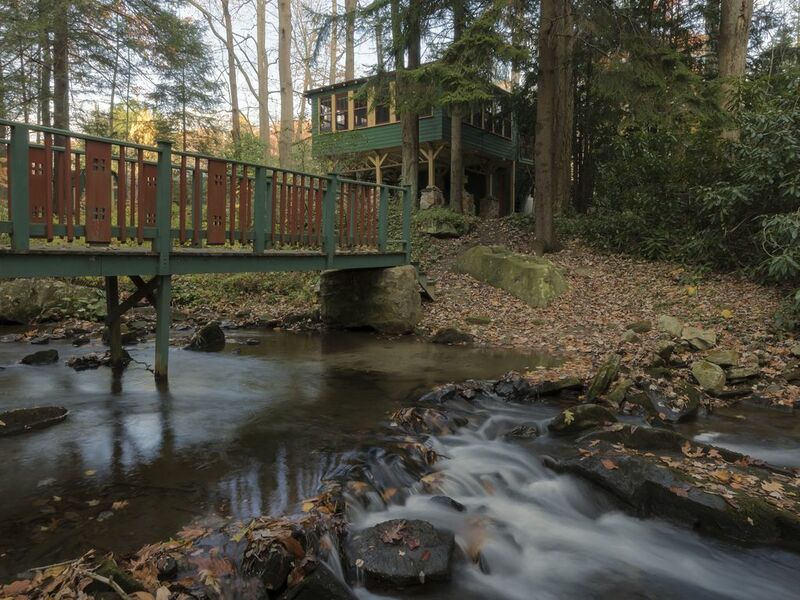 The backyard of this cabin with hillside woods, fire pit, Adirondack chairs, foot bridge, and rushing stream is clearly the star of this property. While the front door is close to a busy road, most traffic passes by without a visitor's notice. The great room at the back of the house is comfortable and spacious perfect for meals, conversation, and game nights. We enjoyed all that this house had to offer. Creek, Fire Pit, Sun Room, and close proximity to Seven Springs!! Thank you so much; You are welcome back anytime! We enjoyed a great weekend ski getaway at Hidden Valley and were so lucky to find this gem, which is located only a few minutes away from the slopes. What an amazing view of the stream out the back, so peaceful and relaxing. We hope to return this summer! Located in the heart of the Laurel Highlands Region. Between Hidden Valley and Seven Springs Ski resorts; Minutes to either one! 1 mile to ski lift and tubing park. Short scenic drive to Frank lloyd Wrights Fallingwater and Kentuck Knob. Short drive to White Water Rafting at Ohiopyle State Park. Walk to State Park with Lake. Walk to resturaunt with outdoor seating. Ski: 1 mile to ski lift! Located directly between Seven Springs and Hidden Valley resorts. Minutes to either one! 1 mile to tubing park!